When spinal spaces narrow in certain areas, it’s referred to as spinal stenosis. Often affecting the lower back and neck, the condition can be a source of localized pain or discomfort felt in nearby areas (radiculopathy) if nerves traveling through the affected area are compressed. Stenosis of the spine can be caused by a deformity present at birth, an injury, or age-related spinal changes or wear (degeneration). 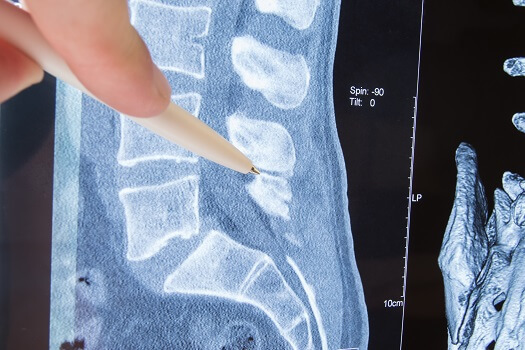 Here’s what you need to know about three of the most common types of spinal stenosis. Sometimes called lateral spinal stenosis, foraminal stenosis is the most common type of spinal narrowing. With foraminal stenosis, cervical disc space is usually narrowed, although the lumbar (lower) spine is sometimes affected. Specifically, it affects side holes that nerve roots travel through (neuroforamen) in the back of the spine. Contributing conditions such as degenerative disc disease or facet joint arthritis may result in the formation of bone spurs that trap nerves. Typically, patients with foraminal stenosis experience non-continuous pain that develops over time. An MRI or CT scan with myelogram (contrast dye) usually confirms that this type of stenosis is the source of pain and related symptoms being experienced. Often caused by arthritis of the spine, central canal stenosis affects an area around the spinal cord known as the thecal sac. If the spine narrows in this particular area, this spinal component may be compressed as well. Sometimes, a group of nerves at the end of the spinal cord (cauda equina) become irritated or compressed because of central canal stenosis. Nerves within the thecal sac itself may also be affected. Additionally, herniated or bulging discs could contribute to this type of stenosis, as can any injury or deformity that throws off alignment in the passageway with the spinal cord and nerve roots. Diagnosis usually involves a physical exam and results from image tests. Bone scans and blood tests may also be done to determine if central canal stenosis is what’s causing your symptoms. Treatment may include a surgical procedure such as a lumbar foraminotomy. Los Angeles patients should consult a spine specialist for expert advice about proper diagnosis and treatmen. If spinal stenosis isn’t causing you any significant discomfort, periodic observation may be all that’s necessary. However, if you’re experiencing muscle weakness, limited mobility, local and traveling pain, and other disruptive symptoms, treatment may involve over-the-counter and prescription medications, low-impact exercises, and massage therapy and other forms of therapeutic physical therapy. If symptoms persist, various stabilization and decompression procedures can be performed, often with less invasive techniques. If you’re experiencing chronic or severe back pain, it’s best to get it checked out by a specialist as soon as possible. Schedule a consultation with an experienced spine surgeon. Los Angeles residents should reach out to one of the friendly representatives at The Spine Institute. Call 310-828-7757 today and schedule an appointment.